Engineered to meet point-of-care, bedside, and emergency situations, the SonoSite NanoMaxx handheld ultrasound machine blends portability with substantial imaging quality optimal for increased diagnostic confidence, accuracy, and ease-of-use. 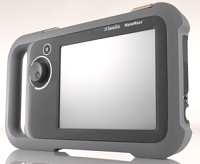 The Sonosite NanoMaxx ultrasound features uniquely simple controls and high-quality diagnostic imaging through technologies such as color power Doppler and color-flow velocity. Its touchscreen user interface also enables easy, straightforward interaction, just as if you were using a tablet. Moreover, you can access many diagnostic functions with one-button control. This handheld ultrasound is also splash resistant, making it easy to clean and disinfect. It is also drop-tested at three feet, and it is capable of handling most bumps and dings. The Sonosite NanoMaxx ultrasound allows you to take measurements right from the touchscreen interface, and you can take advantage of 2D, M-Mode, and color ultrasound exams. This is an ideal system for PICC lines and other needle-guided procedures. The NanoMaxx has very similar image quality to the SonoSite M-Turbo. It has compound imaging (SonoMB) and Speckle Reduction (SonoHD), which help improve image quality. The NanoMaxx is a solid ultrasound system, although in some cases its popularity makes it hard-to-find.